70 Real natural jade stones for maximum heat transfer and pain relief. Side cutouts allows you to fold the pad around joints without uncomfortably “bunching up” fabric (also acts as a cut out for your neck). Velcro Strap holds the pad in place. Plus you can unplug and walk around (Holds heat for up to 6 hours). Put it in the fridge and use it as an ice pack. Durable travel and storage carrying case. Automatic shutoff timer so you can fall asleep with it on without worrying about it running all night. Extra-long, 14-foot power cord to reach almost any outlet, compatible with 110V and 250V. 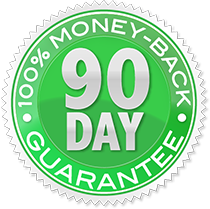 90-Day Money Back Guarantee + Two-Year Limited Warranty. Iso-Wrap DeepHeat Far Infrared Heating Pad - 12” x 27”. HOW CAN Dr. Clarks Deep Heat - Far Infrared Heating Pad - Iso Wrap HELP? The Iso-Wrap DeepHeat Far Infrared Heating Pad is the ideal model for targeting specific body parts, such as… your shoulders, neck, knees, legs, arms, elbows, etc. Just plug it in and lie down. In just ten minutes, heat will penetrate your muscles. And you'll feel as carefree and relaxed as if you've just emerged from a hot tub. Deliver Far Infrared (FIR) energy to your with body—row-upon-row of real polished Jade stones. With these DeepHeat Far Infrared Pads, when the jade is heated, it transports the far-infrared waves deep into your body (up to 2 inches) to warm, soothe, cleanse and relieve your pain. That is 20 times deeper than conventional pads for deep relief. In other words, deep penetrating infrared heat delivers more oxygen-rich blood to painful or injured areas which helps take your pain away faster. Best of all, 15 to 30 minutes a day is all it usually takes to feel the results. Jade stones emit far infrared heat waves to heat, soothe, and calm your muscles. Quality craftsmanship ensures even heat delivery across the entire heating pad. Far infrared heat penetrates up to 2 inches. That is 20 times deeper than conventional pads for deep, long lasting pain relief. Unlike ordinary heating pads, our FIR heating pads have been designed specifically to minimize harmful electromagnetic fields as much as possible. Because the specially designed jade stones retain temperature, you can remove the detachable cord and throw your DeepHeat heating pad in the freezer to double as a cool wrap because Doctors recommend ice — not heat — during the first 48 hours of injury. Inline digital controller makes it easy to adjust heat settings for the exact comfort level you need and will never overheat. The Iso-Wrap features cutouts to keep the heating elements in contact with your skin (which prevents the fabric from bunching up when wrapped around your joints). Our far infrared heating pads are made from high quality materials and built to last, delivering deep relief not only for the pain you're experiencing now, but any conditions you or your family members may experience in the future. Take DeepHeat with you on the road when used with the optional Pure Sine Wave Car Inverter that plugs into any standard car power outlet. Wraps any area of your body for maximum comfort and rolls up for easy storage. 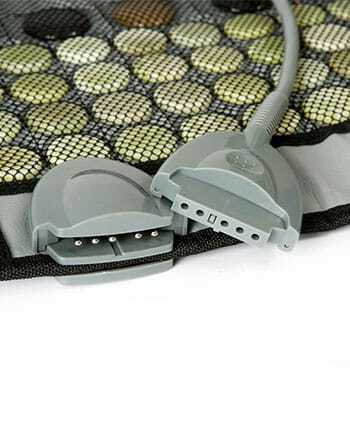 The Iso-Wrap comes with adjustable velcro straps keeps the pad comfortably in place when wrapped around your arm, leg, shoulder or back as you move about your day. Feel the warmth in just a few short minutes with strategically placed heating stones in every DeepHeat pad target hard-to-release muscle knots. The simple controller turns the pad on/off, heat up or down. 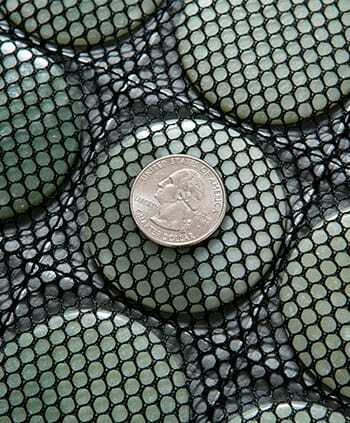 The stones in DeepHeat will stay warm for up to 30 minutes after it is unplugged (for mobile far infrared heat relief). 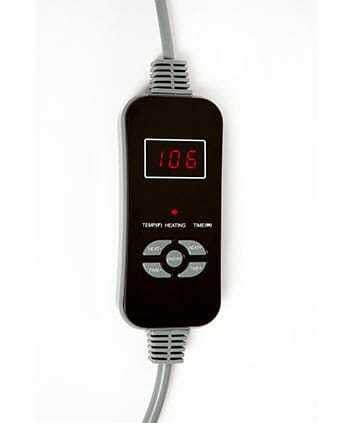 Automatic timer allows you to program shut-off at any 15-minute interval. (with a max on time of 4 hours). 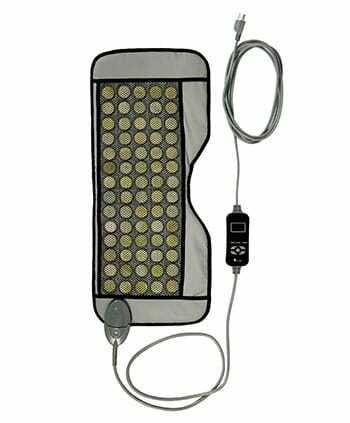 The infrared heating pad is the best investment I have made in regards to pain relief. I have suffered from neck and back injuries for over 10 years. I have several bulging discs, bone spurs, stenosis and arthritis in both my neck and lower back. 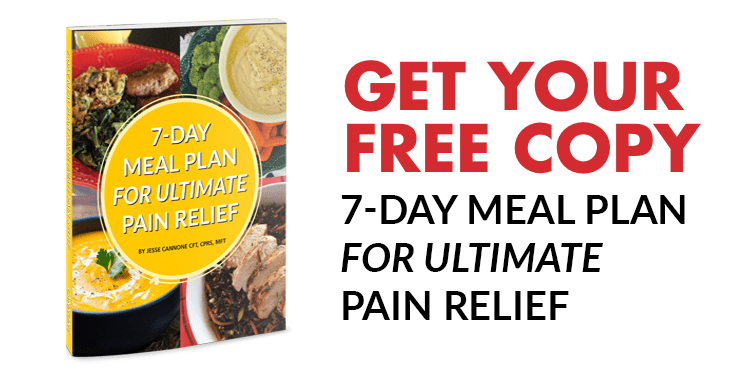 The many combinations of medications and various injections were the only sources of relief I had until I purchased the heating pad from the Healthy Back Institute. I have owned several heating pads throughout the years and while the heat helped ease the pain, the effects were short-lived. The relief I get from this heating pad lasts for hours. I am able to move around much easier and perform the normal household work like vacuuming and mopping that I was told to avoid. Every morning before work and every evening after work, I spend 1/2 hour to an hour on the heating pad and get immediate relief from my lower back pain and then I use it on my neck and shoulders at the end of the day to relieve the tension built up from working on a computer all day. At the first sign of muscles spasms in my back, I use the heating pad. It keeps my back from becoming so painful that I have to stay in bed for a day to get over it. Usually, just an hour or two on the pad will relax and soothe the muscles, and then I am good to go again. For me, the heating pad is a God-send. As a result of heat applications and recommended stretching exercises, my sciatica is no longer troubling me and I am again playing tennis 5 times a week at age 84. No more pain pills for me! I'm a Mom to two special needs kids so I do a lot of bending at home, but at work all I do is sit all day. It finally caught up with me and I started having debilitating sciatica pain. Chiropractic and physical therapy helped a little but not enough to get me through the pain. It was so bad I couldn't sleep at night. After doing your exercises ofr sciatica, and using the Rub On Relief® and DeepHeat™ religiously, the pain is gone. If it acts up again I just pull out the heating pad and do my exercises. No more “pain pills” for me! We guarantee you’ll love Far Infrared Heating Pads or we’ll refund your money.